CD-ROM or Video you need in order to study successfully for your final exam. 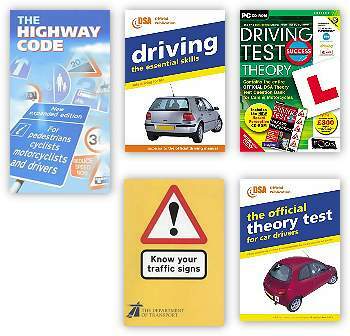 'Highway Code', 'Driving - The Essential Skills', 'Know your Traffic Signs', 'The Official Driving Test', 'Theory Test Questions' and 'Hazard Perception' CD-ROM or Video. Please feel free, without obligation to contact us with any questions or comments regarding our company or services. Progress Driver Training wants to assist you with ANY questions that you may have. We are only a phone call or email away...with quick answers to all your questions about Learner Driving Lessons, Approved Driving Instructor Course, Pass Plus, Intensive courses or any special needs requirements. Intensive learner driving courses available throughout Ayrshire, Inverclyde, Renfrewshire and Dumbarton.